The speaker provides 90° horizontal by 45° vertical coverage with thermal, overload, analog limiting, and power compression protection circuitry with LED indicators for power and clipping. Inputs are provided by balanced XLR combo mic/line inputs. Additional speakers can be connected to the signal using the rear panel output and onboard contour controls allow you to adjust the response of the speaker to your room. For portability, the speaker box is made of lightweight injection-molded polypropylene with built-in handles, metal grills, and rubber feet. It's trapezoidal shape allows it to be used as either a floor monitor or a main. An integrated 36mm pole socket allows you to mount the speaker on a tripod stand or atop a subwoofer with a speaker pole. The speaker is designed in the USA. Box Dimensions (LxWxH) 20.25 x 14.0 x 13.48"
TX10 280-Watt 10" 2-Way Active Loudspeaker is rated 5.0 out of 5 by 3. Rated 5 out of 5 by Steve from Great speaker, great service, price and free 2-day shipping I was searching on the internet for additional powered floor monitors. The band currently uses 4 monitors, one powered and three passive. 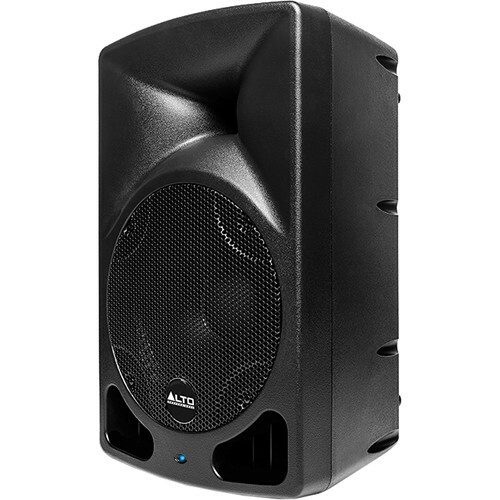 The one powered floor monitor we have is the ALTO TX-10. I saw the ALTO TX-10s at B&H at a great price. I order one and another band member bought an additional monitor, both on-line and hassle free. We now have and use all three ALTOs TX-10s. They all work great and have performed well and built to take some banging around loading and unloading the equipment out of our transport vehicles. I will be checking out B&H's website and will not hesitate to make future hassle free purchases. Very much appreciate the service and products. Rated 5 out of 5 by William from Replaced a couple of TX8 speakers These get LOUD. Impressive. I liked the TX8 speakers, but the small speaker provided listed low end. These do a lot better - though nothing replaces a sub-woofer - but for announcing outdoor events, both the TX8 and TX10 speakers can be heard even outdoors quite well. These TX10 speakers are combined with a couple of Auray speaker stands, Alesis 8 channel mixer and some Shure SM58 mics. We use this portable setup to announce at an outdoor equestrian center - and play music when there is in-between time. Rated 5 out of 5 by David from Clarity with volume We used this speaker to announce upcoming events and game results on our 8 outdoor Pickleball courts. This speaker was easy to set up and was clear to the ear. We will be ordering another one for our back courts. can you link up two speakers? Hello,Yes, the TX10 has link outputs on the back of the speaker that can be used for linking two speakers together. Are covers or transport bags made for these TX10 speakers?